Posted on Thursday, October 16th, 2014 at 2:05 am. When we respond in a non-assertive way, our self-confidence and self-esteem suffers and that will make us even less assertive in the future. What is the reason we act this way? Why can’t we stand up for ourselves? Why do we let others push us against the wall? The problem starts in our self-confidence and self-esteem, or the lack of it. By not asserting ourselves to others, it invites them to treat us that way. If you want to change all that and transform into an assertive and confident person, consider joining the Assertiveness and Self-Confidence Training Course of PD Training in Singapore. Our previous roles can also dictate how we are. If you had a low work status in a previous job, it may put a great amount of pressure on you to conform to your given role. Think about this for a moment. Would you be less likely to be assertive to your boss than you would be to a colleague whom you consider your equal or lower than you? If you are, then you may have had a previous role that made you think this way. Assertiveness should not be limited to rank. Experience in our younger years may also play a part in being non-assertive. If we have modelled ourselves based on our parents or role models who were also non-assertive, then we would also be like that. This is called a learned behaviour and it can be very difficult to undo because of the years of repetition. Stress can also play a big part in being non-assertive. Stress can make you feel like you have no control over the events happening in your life. Usually, people who are stressed often become either passive or aggressive when conveying their thoughts and feelings. Their actions are more likely to increase their own stress levels, as well as those around them. There are some who insist that they were born that way and that there is little they can do to convert from passive to assertive. This is not true because anyone can learn to change and be more assertive if they allow it. All it takes is the commitment and willingness to change. 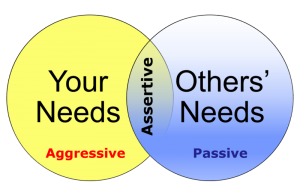 Keep in mind that being assertive doesn’t mean you always get your way, no matter what. You need to understand that each one of us has basic human rights and that we need to uphold and respect those rights. When we respond in a passive manner, we tend to ignore or neglect those rights. When we respond aggressively, those rights might be abused. These rights vary from person to person, and vary between different cultures. Let PD Training in Singapore guide you in your quest for change. You deserve it and everyone else in your life deserves it. Go ahead and be the new you, today. PD Training delivers thousands of professional development courses each year in Singapore so you can be assured your training will be delivered by a qualified and experienced trainer. All public Assertiveness & Self-Confidence Training courses include am/pm tea, lunch, printed courseware and a certificate of completion. Customised courses are available upon request so please contact pd training at enquiries@pdtraining.com.sg to learn more.